One of the most common types of physical complaints is that of pain in the shoulder. The shoulder is composed of multiple joints, tendons and muscles that all join together to provide you with an increased range of movement in the arm. Since so many different structures make up the shoulder, it is particularly vulnerable to a number of different issues. Rotator cuff pain is one of the more frequent sources of pain in the shoulder. Typically the patient with a rotator cuff tendinopathy will have difficulty and pain lifting their arm above their head, placing their arm behind their back (for example putting on a coat, or reaching for a bra strap), and sleeping on the affected side. Rotator cuff tendinopathy is often known as supraspinatus tendinopathy, because it commonly affects the "supraspinatus" muscle. 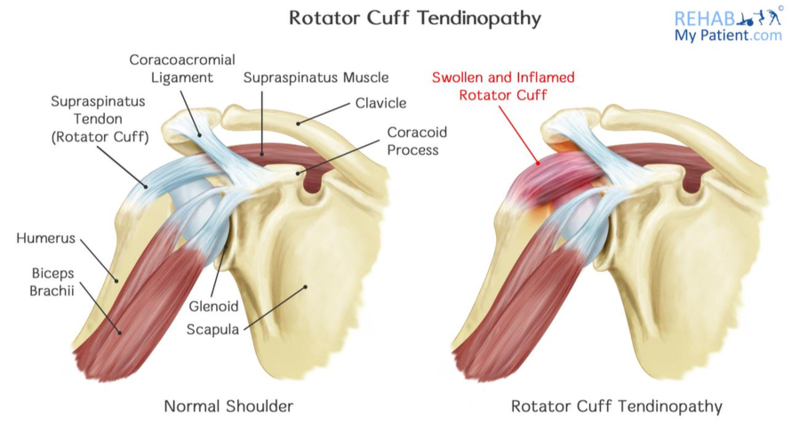 However, rotator cuff tendinopathy can in theory apply to any of the rotator cuff muscles. The shoulder is made up of three bones: the upper arm bone, the collarbone and the shoulder blade. The shoulder is actually a ball-and-socket joint. The ball of the upper arm fits securely into the shallow socket within the shoulder blade. Your arm stays in the socket by the rotator cuff. The rotator cuff is composed of four different muscles that join together as tendons and form a covering surrounding the head of the humerus. The rotator cuff connects the humerus to the shoulder blade and aids in rotating and lifting your arm. There is a lubricating sac known as the bursa that lies between the rotator cuff and the bone that sits on the top of the shoulder. The bursa allows the rotator cuff tendons to freely glide whenever you move your arm. One rotator cuff muscle is particularly vulnerable. This is called the supraspinatus. The tendon of the supraspinatus attaches to the humerus (arm bone) and this tendon can become over-used, or degenerate, which can cause rotator cuff tendinopathy. Arthritis of the acromioclavicular joint (ACJ) including osteophytes. Over-use of the tendon and shoulder in sports. General degenerative changes around the shoulder. If rotator cuff tendinopathy continues to be a problem, the tendon can form a tear known as a partial thickness tear. One of the first things the doctor or physical therapist will probably suggest is rest from any aggravating activities, such as avoiding doing any type of overhead activity or sports which may be causing the problem. Golf and racket sports are commonly problematic sports. A non-steroidal anti-inflammatory medication can help to reduce swelling and pain in the affected area. However, if after two weeks you have not had improvement from anti-inflammatories you should either go back to your doctor or your therapist. Physical therapists, osteopaths, chiropractors and sports therapists will initially focus their attention on restoring normal movement to the shoulder. Stretching exercises for improving range of movement are extremely helpful. If you are having trouble reaching behind your back, you might have developed a tightness in the posterior capsule that makes up the shoulder. Using a specific type of stretching exercise for the posterior capsule can be quite effective in relieving shoulder pain. As the pain improves, the therapist will start you out on a strengthening program to help your rotator cuff muscles. If medication, rest and physical therapy aren't relieving your pain, an injection of a local anesthetic and cortisone might prove beneficial. Cortisone is an extremely effective anti-inflammatory medication. By injecting around the ACJ it can reduce the inflammation on the supraspinatus tendon which can help reduce pain and improve range of movement. Individuals who use their arms a great deal for overhead movements are particularly vulnerable to injuring the rotator cuff. This is a common problem experienced by golfers and weightlifters. Pain can often develop from a minor injury, but there are instances where it occurs without any obvious cause. Repetitive lifting activities involving the arm, such as construction, painting and hanging paper leave you prone to injuries in the rotator cuff. If you start experiencing pain when serving a tennis ball or throwing a ball, you might be in the early stages of tendinopathy. Pain that is present when engaging in the activity and resting could be a sign of rotator cuff tendinopathy.